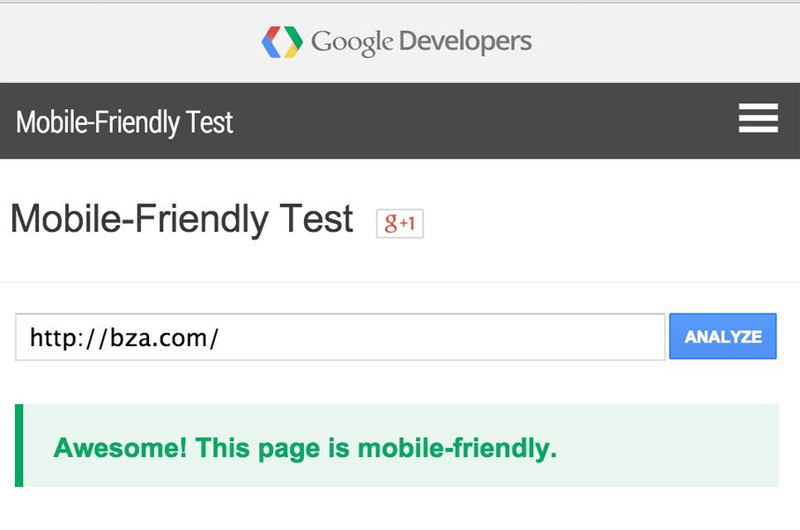 How Will Google’s Mobile Friendly Update Effect Your Search Rankings? Google’s mobile friendly search ranking update is scheduled to go into effect on April 21, 2015. This means that Google is going to start using mobile-friendly compliance as a ranking factor in smartphone search. Site owners that are not mobile compliant, and have their site registered with Google Webmaster Tools, are receiving emails telling them that they have “mobile usability issues”. The notice goes on to say “… pages will not be seen as mobile-friendly by Google Search, and will therefore be displayed and ranked appropriately for smartphone users”. If you do not know if your site is compliant, you can run a simple test by using this tool: https://www.google.com/webmasters/tools/mobile-friendly/. How to Estimate if This Ranking Change will Affect Your Traffic? To best understand how this might affect your organic search traffic take a look at your Google Analytics audience demographic for mobile. There you will see the breakdown of visitors from mobile, desktop and tablet. If you have a high percentage of visitors from mobile devices who arrived at your website via Google Search, for example 25% or above, that means you risk being poorly ranked for 25% of your incoming traffic. Website owners in this situation should immediately plan to make their site mobile friendly. If you you need help in figuring this out please contact us. All the websites that BZA has been building for the past few years have been mobile-friendly. If you would like to discuss your current situation what your options might be please e-mail or give us a call. Should You Mobilize Your Website? Just this week, orders for the iPhone 5 topped 2 million in their first 24 hours, more than double the amount of its predecessor over the same period. There is no doubt Smart phone users are dominating the mobile market. The easiest way to establish a positive relationship with mobile users is to create a mobile website for your organization. If your website is built on a WordPress platform, BZA can easily develop a mobile theme for iPhone, iPad, Android, Blackberry and Samsung mobile visitors. How do we make this work? Your newly mobilized website works by detecting devices like iPhones, iPads, Android & and more, serving its optimized themes instead of your regular desktop theme. Visitors have the option to switch to the desktop theme if they desire. 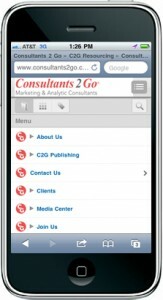 We encourage web site owners to take a look at their existing web site on mobile devices and see how their site renders. You will quickly notice that browsing a desktop web site on a mobile phone is a frustrating experience. Sites utilizing Flash menus or sites built entirely in Flash will not operate on an iPhone or iPad. Your mobile web site will become an invaluable asset that is available from any location at any time of day or night. 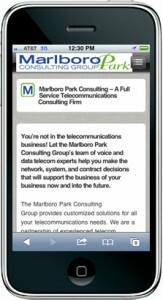 BZA recently launched a mobile website for Marlboro Park Consulting enabling the site to display it’s content based upon the users mobile device. This accomplished by the website auto detecting the screen size, so it doesn’t matter is a user have 3 inch or 10 inch screen. It will automatically format the website content and images according to the size of the screen. 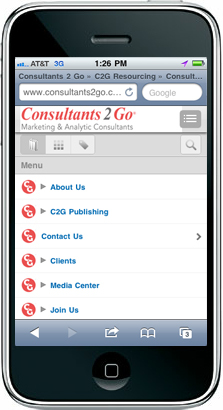 The mobile site is branded with Marlboro Park Consulting logo in the header and and graphical icon. Because the site is based upon the desktop version the client has only one site to maintain. As I was checking our Google Analytics, I was particularly interested in the mobile device traffic to our web site. Approximately 5.2 % of all traffic to http://www.bza.com is coming from a mobile device. But what I found even more interesting is that in December our mobile traffic was 1.37% , followed by January at 3.2%. When you crank all the numbers it equates to the fact the our mobile traffic is doubling each month over the past three months. That is amazing! I will add that we have not done any mobile marketing campaigns but as you might know we introduced our mobile web design and development services in February. When you drill down into the data I can see 71% of our mobile visitors are using an Iphone followed by 12% on Android. Surprisingly Blackberry makes up only 5% of our mobile visitors. The mobile web is not merely a fashion trend; it is one that will be with us for a very long time. Here are few import points to consider when designing a mobile enabled website for your organization. Less is better. Plan your information architecture based upon what users typically want first when they go to your web site. 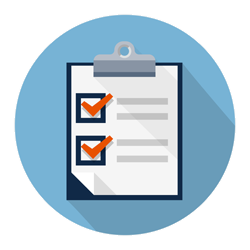 Make a list and prioritize each page or function. Minimal use of graphics. The on-the-go mobile user is not going to be wowed by images, pictures and graphics. They are browsing because they are looking for specific information. You want them in and out of your site. You’ll wow them with simplicity. Button and font size. Eliminate wasting your visitor’s time by make links and buttons a size that is finger-friendly. Tiny text and button will just bring the visitor closer to exiting your web site. If you want to sell products or services via your mobile website, think about using PayPal or Google Checkout. This eliminates the visitor from having to type in all contact and credit card information. Promote your site through geo-targeted sites like Google Maps, Bing Maps and Yelp. For more information visit BZA’s mobile enabled web design services . With just over 40% of Americans currently owning a smartphone the number of on-the-run web surfers continues to growth. BZA is now helping companies gain customer loyalty, increase exposure and web traffic by developing mobile websites. According to a recent Gartner Group report by year-end 2010, 1.2 billion people will carry handsets capable of rich, mobile commerce providing a rich environment for the convergence of mobility and the Web. Although larger organizations can afford custom App development for both the Iphone and Android platforms, small and medium organization can choose a more affordable browser based solution. For more information see BZA’s mobile web design services. BZA was chosen to be a participant in the American Express OPEN Externship program. Amex assigned a team of talented professionals to develop a Mobile Marketing – Market Entry Strategy for BZA. This week the team came out to BZA’s office from their NYC headquarters to present their findings. The comprehensive report and presentation included an executive summary, recommendations, mobile market overview, competitive landscape, market opportunities, market entry strategy, and pricing strategy. Soon you’ll see new Mobile Marketing offerings from BZA.